Cyclists in the City: Olympics boss: main traffic-free cycle route to Olympics will be shut during the Games. Another Olympic boss: cycling parking in new homes at Olympic Park is 'PC'. Olympics boss: main traffic-free cycle route to Olympics will be shut during the Games. Another Olympic boss: cycling parking in new homes at Olympic Park is 'PC'. Pictured left, is TfL's map of the cycle routes to the Olympics. In the bottom of the picture is the roundabout at Bow where two people were killed on their bikes late last year. One way to cycle to the Olympics will be along that same Cycle Super Highway marked in blue. Last November, a TfL director actually told the BBC that cyclists should avoid using this route. At the time, I pointed out how unbelievable it is that TfL could build a bike route to the Olympics - a route that it considers so dangerous it advises people not to use it. To be fair, TfL has committed to installing safer cycle infrastructure into this roundabout and will have built that in time for the Olympics. That still won't make the rest of the blue paint route particularly safe, let alone pleasant, though. So, your other option might be to use the quiet route marked on this map in green, along the river and nip under the roundabout and the motorways for safe, easy access to the Olympics. There's even a brand new floating towpath along the river so you can cycle uninterrupted and away from the traffic. 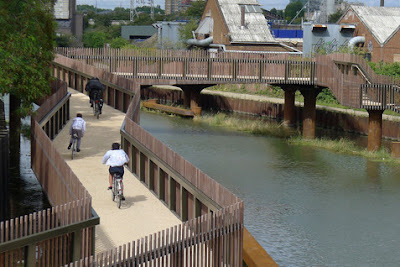 Last year, Leon Daniels, the man responsible for London's roads, told cyclists on his blog that the towpath would be an excellent route to cycle to the Olympics park. From the south, he said, 'us[e] the access ramp onto the floating towpath in the north-west corner of the roundabout [and] head back under the flyover/roundabout using the new floating towpath.' The towpath route is a brilliant new asset to people who want to cycle north to south without having to cycle along, err, a six lane motorway. It's a great leisure route and it's a fabulous thing, provided you're cycling during daylight. The thing is, it's going to be shut during the Olympics. Yesterday, at the Olympic Transport committee in the London Assembly. So the man responsible for London's road, Leon Daniels, was wrong to say cyclists should cycle along the floating towpath because it's not going to be an option. Now those two things mean that cyclists are going to have to use the Bow Roundabout which will not be at its best - it certainly won't be to the level of safety that we've all discussed. You're actually forcing cyclists off of Greenways onto dangerous roundabouts. Hugh Sumner. Errm I don't agree with that......... "
There's plenty more that you can watch in his response on cycling issues here on the London Assembly video (watch out for the unbelievably clunky video) from minute 56 onwards. I don't think matters are quite as apocalyptic as Jenny Jones makes out. You'll still be able to get to the Olympic park from the south but I imagine you'll have to detour and cross the six lane motorway also known as Stratford High Street. But Jenny Jones does have a point. I don't know the people behind the Olympic organising team. But they really don't seem to 'get' that cycling is a legitimate form of urban mobility. Back in February, at another London Assembly Committee, Kathryn Frith, who is the Chief of Design for the Olympic Park Legacy Company (ie this is the woman responsible for a master plan for the Olympic Park to cover the next 20 years) described bike parking as 'PC'. PC?! This is a 20 year master plan. Does she expect London will be full of even more cars by then? I'm glad that Transport for London is implementing a new scheme to make it safer for people to cycle east to west across Bow roundabout. But I think it's tragic that even the one tiny piece of cycling infrastructure that was put in place for the Olympics is actually not for the Olympics at all. It's only going to be useful after the event. As usual, if you want to cycle to the Olympics, you can expect to take a detour, dismount from your bike, cross the motorway, may be you'll be able to get back on your bike again after that. But I find it profoundly depressing how we're completely failing to build cycling into this massive scheme. Here was a one-off chance to get cycling right. Brand new urban environment, real opportunity to build cycling as a sensible, safe urban mobility option for everyone. And what's happened? A bit of a tow path, a bit of a greenway, a bit of retro-fitted infrastructure on a killer roundabout but only after thousands of people protested. I managed to buy tickets for the Olympics. I'm quite excited. And I'd like to cycle there. But I'm not going to bother cycling. It seems like too much hassle, frankly. I'll take the tube. Or I might drive instead. Because the Mayor of London is letting people make London a city for driving in. The thing is, the Mayor also wants to make London less congested. He knows there are more and more people and they can't all drive their cars all the places they want to without the whole thing coming to a halt. At some point he needs to lead his cycling revolution from the front. And that means telling people in the various Olympic authorities that they're not up to scratch just as much as it means he can't get away with just slapping blue paint around the place. Yet another olympic waste of money so glad not staying in london while its on. Us locals can't cycle can't drive and have been told to not use public transport. How exactly do we get about then LOCOG ? What does 'PC' mean here? Police Constables? Or is it Piece of Crap? Prostate Cancer? Politically Correct? 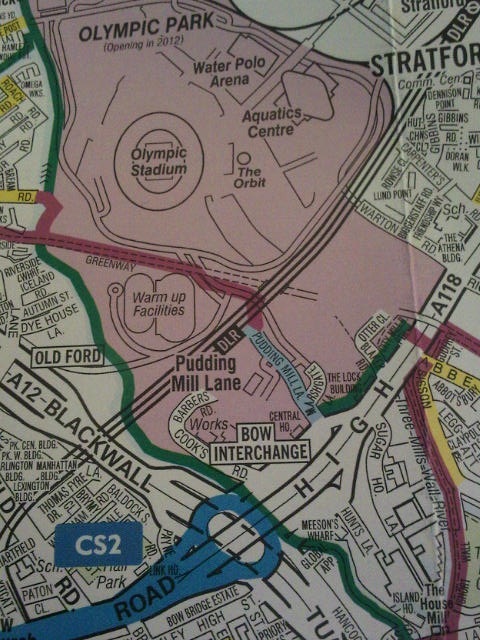 Yes, the entire towpath from the Bow Roundabout up to Hackney Marshes is being closed for the Olympics. Whether we like it or not, it passes directly along the edge of the Olympic Park so is a huge security risk. But according to London 2012's latest closure map (see first comment above), the cycle path won't be closed beneath the bridge. Either Jenny's wrong or the map's wrong. Whichever, it ought to be perfectly possible to keep the floating towpath open whilst simultaneously blocking off all access along the river to the north. It's odd that if Jenny is wrong no-one else picked her up on it and punctured her argument that cyclists were being forced onto the unsafe roundabout. Yet again I am staggered at the stupidity of the people we pay to take the decisions that are supposed to improve our lives. I am really cross about this. I had been enquiring with Hackney council about closures, and they came back and confirmed his news yesterday. The path is being closed all summer, why? DG, I know it runs along the park, and therefore needs to be secure, but that's the point of a route to the games, it actually goes there. This is a crappy decision based on fear-mongering. So fed up with shiny websites telling us what a brilliant, sustainable games these are going to be. So the towpath is to be closed because it is a security risk. Are they going to close the canal as well? It would be easier to launch an attack from a barge than from a bike. Also lots of public roads are on the edge of the Olympic Park. Are they all going to be closed as well? I think the lunatics are in charge of the asylum. I was prevented from entering with a bicycle to the main access road to Westfield and the Olympics by five G4S guards today. Meanwhile cars went past without being checked at all. This is the only access point from the Western side (by the A12) and is closed to both pedestrians and cyclists. They claim that it is not an adopted road, but no one could produce a bye law saying cyclists can not use it. \so they called the police to arrest me. The fact that these facilities are so closed to two mainstream transport methods and the only ones that are ecologically sound and good for health is a scandal. Yes, they're also going to close this section of the River Lee Navigation to boats during the Games, for 19 hours a day, because of the security risk. "From 3 July to 10 September 2012. Boaters wishing to travel along the River Lee Navigation through the area will be required to pre-book passage during two daily navigation windows, from 6-9am and then from 7-9pm." Playing devils advocate I can see that while the river is not a security risk as such closing access makes security much easier for the site. They effectively have a moat on one side which is much easier to patrol and secure than a fence. Obviously that assumes you don't care about cyclists. Something our glorious leaders have shown time and again. Caroline Pidgeon includes raising her concern in her letter to Boris. It just demonstrates that road danger, of any kind, including for motor vehicle occupants as well as more vulnerable people like cyclists and pedestrians, is taken a lot less seriously than terrorism. This despite the fact that road danger is real and tangible and around us every day, while terrorism is largely undefined, invisible, mainly conjectured. Road incidents kill far more people than terrorism, indeed there have been more cyclists killed in London alone, by HGVs alone, since 7/7/05 than were killed by terrorism on that day or in the entire decade 00-10 across the UK. Taking all vulnerable road users, cyclists and pedestrians together, across the UK, more die at the hands of motor vehicles in two months than there have been deaths from terroristm in ten years. There is a strand of opinion that if we adjust our behaviour to terrorism, then we have allowed it to win, as killing is not an end itself for terrorism, but a means to an end. Of couse we do adapt to terrorism all the time - the reductions in our civil liberties being an obvious example - but closing the towpath is, in that view, a surrender in itself. Apparently, the Home Office (i.e. MI5/MI6) is worried about mortar and tunnelling attacks on the Broadcast Centre, which backs on to the path.